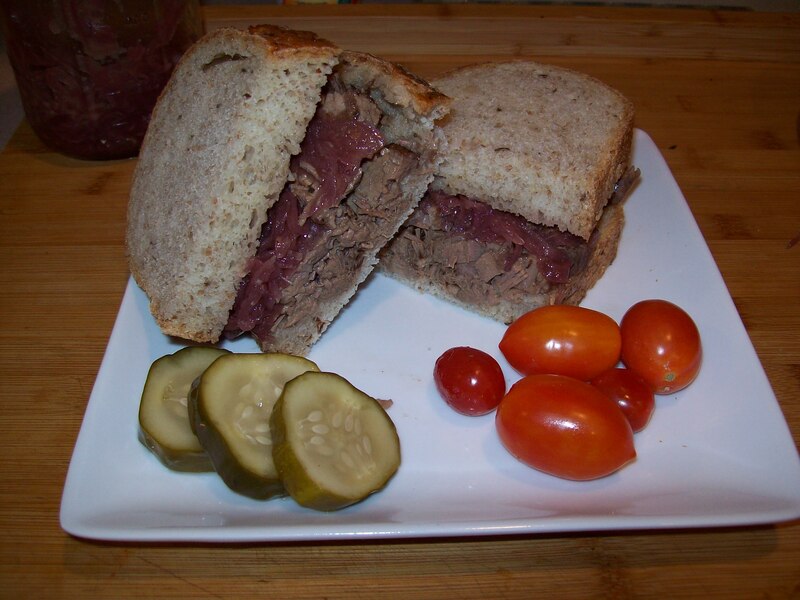 There was a chill in the air and a game on Sunday so I felt a Reign on Brisket sandwich was a good choice. It was more thinking out loud since I did not have a brisket and the one at the store did not look that good. 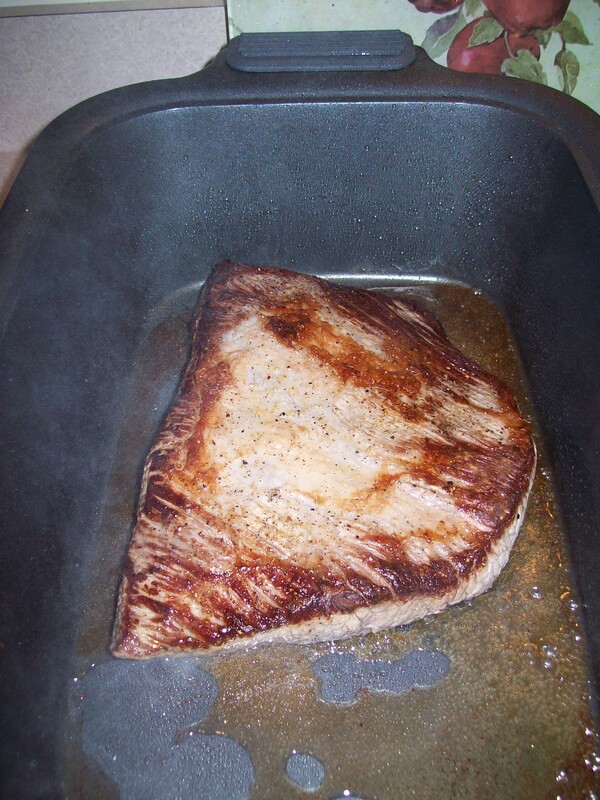 I conceded to next week but when Lyn came home from her errands with a flat cut brisket I had my game plan down. I usually use a Dutch oven for brisket either on stove top or in the oven but I wanted to go out and not have it on my mind that I had to get back so I grabbed our crock pot figuring I can put on low and disappear all day coming home to a house filled with the smell of yummmm. This is a torture because I like to let it sit overnight before reheating and eating. Never mind the fact that I started around 2 PM which meant low on crock pot was at least 6-8 hours of cook time. 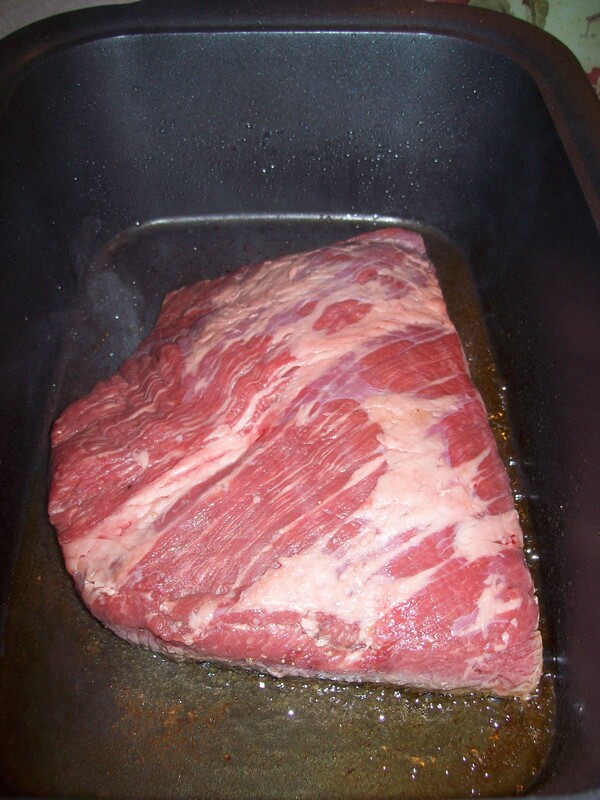 Salt and pepper the fattier side of brisket to taste and put that side down in pan listen to that sizzle. 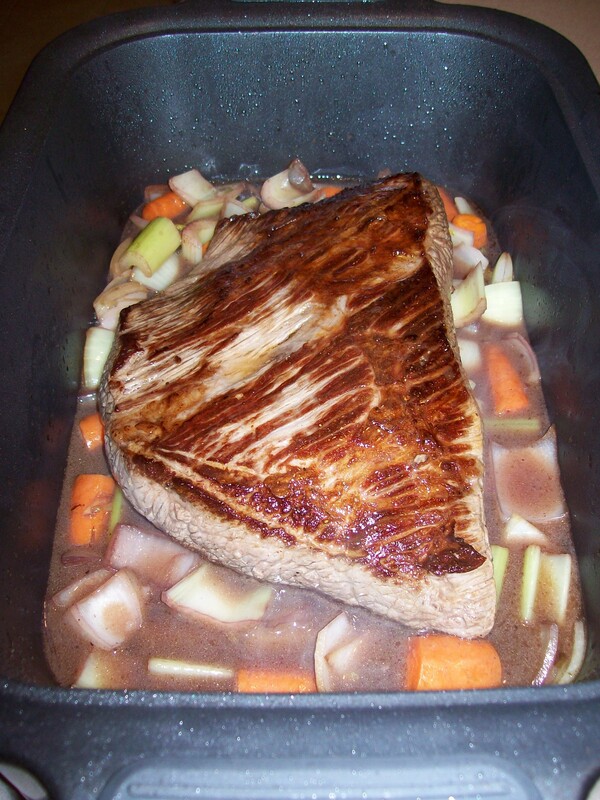 Place brisket on top of vegetable and place in crockpot. 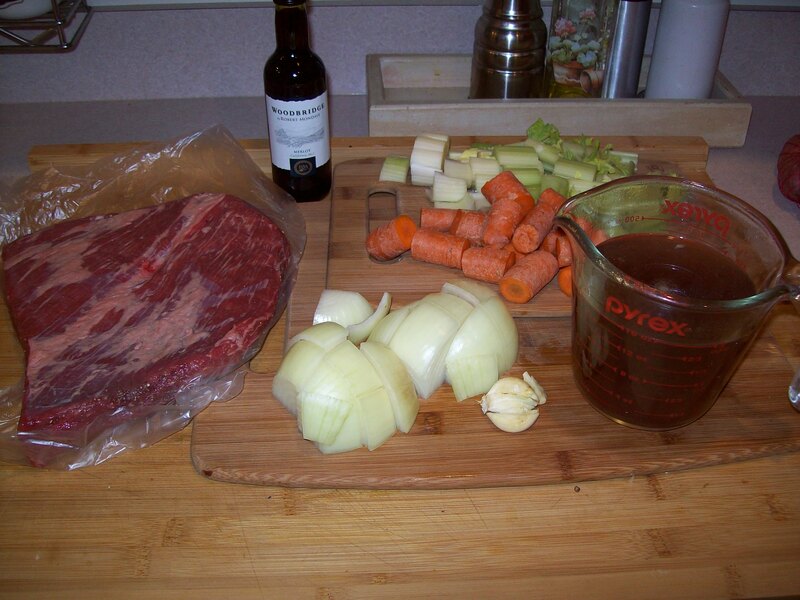 Pour the 2 cups of beef broth in cover and cook to low 7-8 hours. 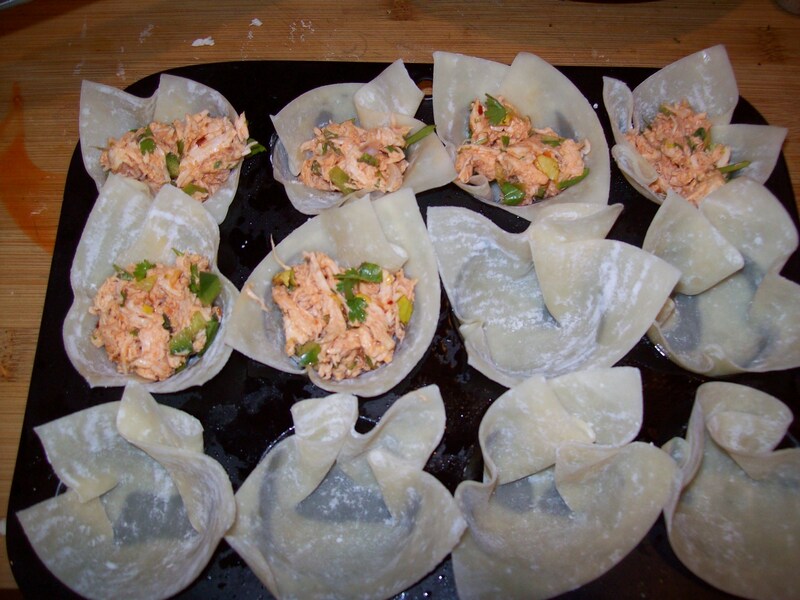 I cooked about 7-8 hours transferred to container, let cool and then cover and place in frig overnight. 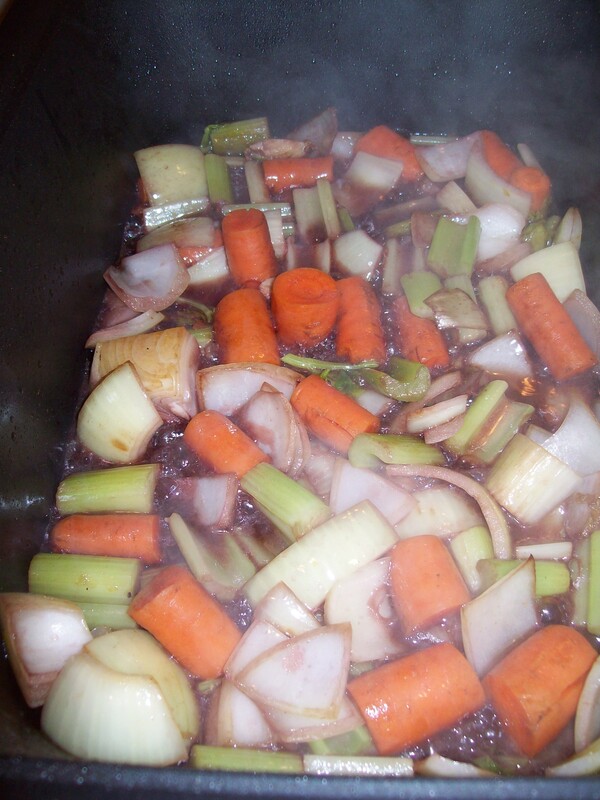 The next day I sliced in about ¼” while reheating the gravy, added the meat and let sit. There are two schools of thought on this some like to slice the night before and store in the gravy I go either way, this time I waited. 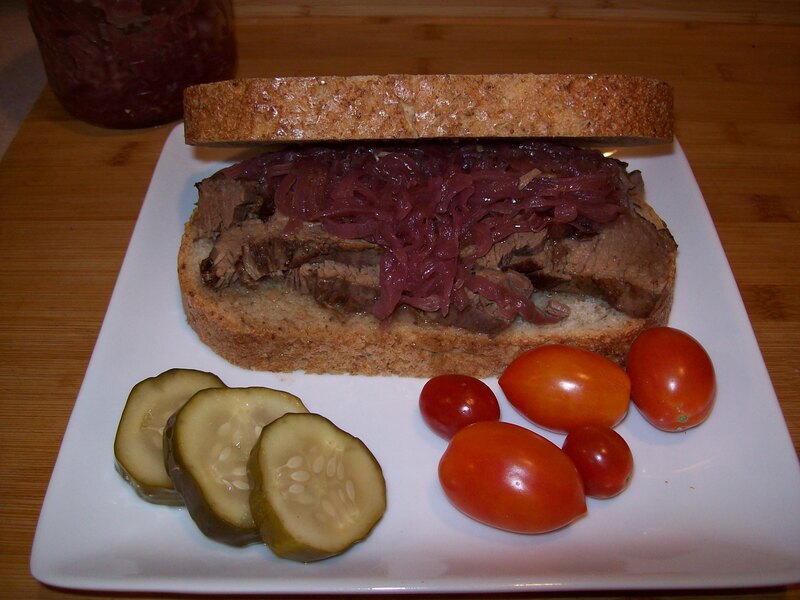 Layered the brisket, drizzled with some of the gravy making sure some got into the bread, top with red onion relish served with home mad dill pickles and garden tomatoes. Sat down for the second half and watched the Pats fall apart just like the slices of brisket except that melted in my mouth. A long time ago I had to stop eating fatty foods they started to do a number on my stomach. 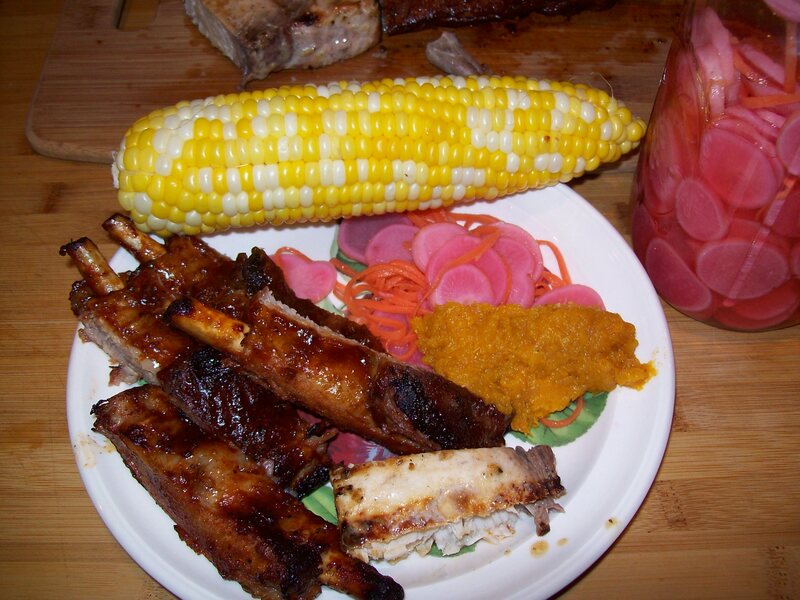 A few things made me decide to go for it this year, 4th of July with Lyn asking what are we going to BBQ and Gloria who recently found my site and wanted to know if I had any good rib recipes. 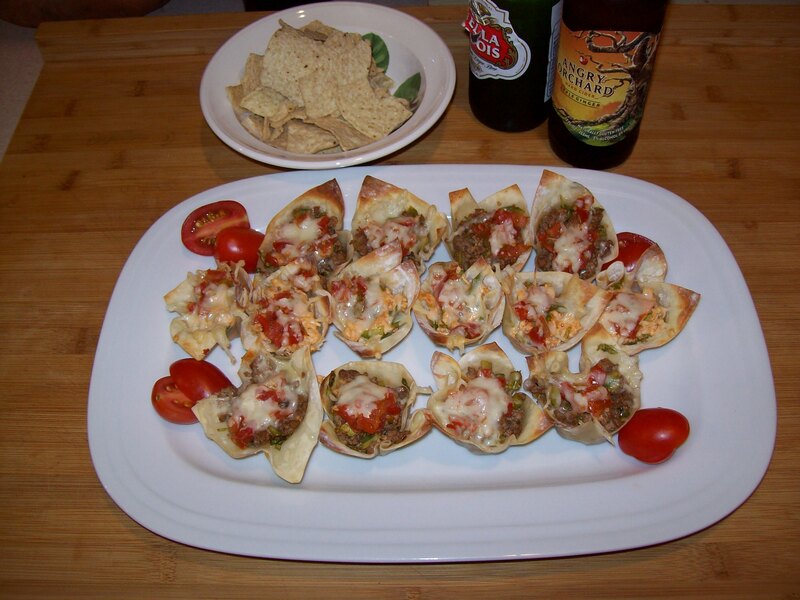 To be truthful the last few times I made them I bought the precooked and just reheated, added my own sauce and there you had it quick and easy but I used to cook these and still had the how in my head. Last year I won a contest with my pulled pork and root beer BBQ sauce so I still have it in me. Then Wholefoods had St. Louis Style ribs on sale and I grabbed a slab, gave it a rub down and let it sit in the frig until yesterday. 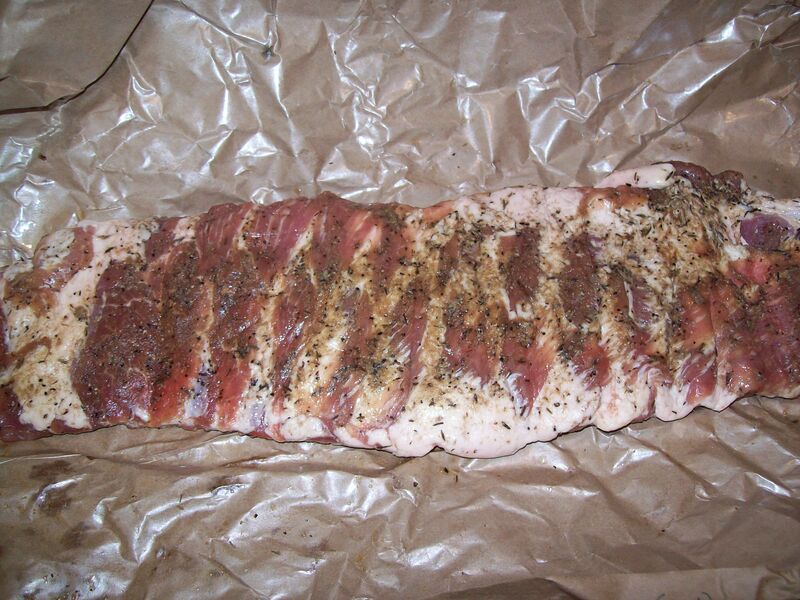 Cooking ribs are relatively easy just time consuming that being said there is a true art to cooking the perfect rib and I am still trying to master that I lift my smoker lid to all those that have satisfied my taste bud in my travels. 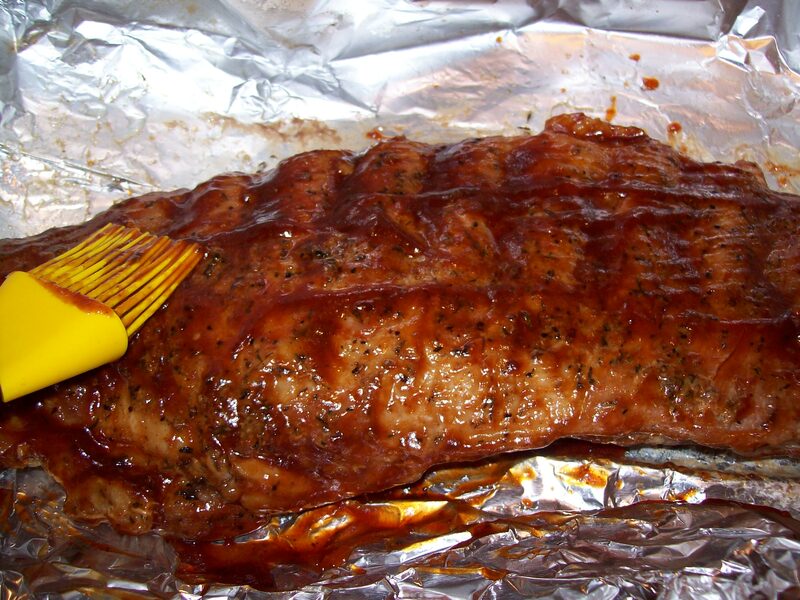 I remember the road trip my brother and I took bringing Mom and Dad’s car down to Florida for them we had ribs all the way down each a different taste treat. I have to say there was a gap of eating ribs for me after that trip. 1 Slab of St Louis style ribs about 2 lbs. Liberally apply the rub of your choice to all sides and give it a good rub, wrap in plastic wrap and refrigerate at least 8 hours, I prefer 24+ in this case it was 48 hours. 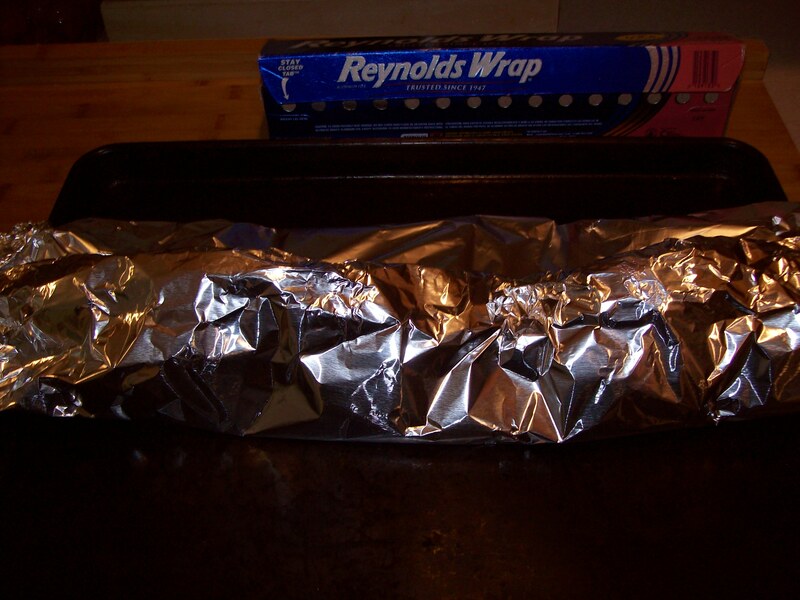 I take two sheets of aluminum foil and join along the sides to make one large one, repeat and lay the 2nd on top. 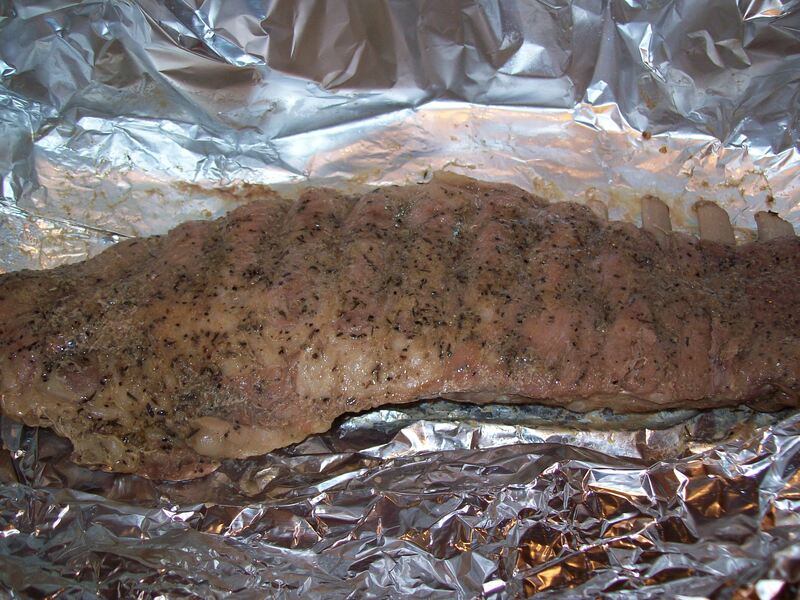 Place the slab meat side down and fold the tinfoil to make an air tight package. 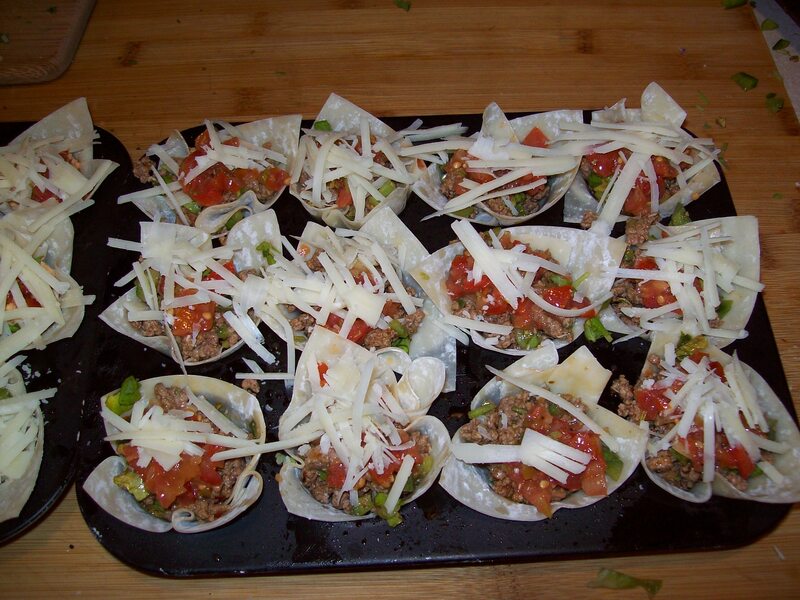 Place on a cookie sheet and bake at 225 to 250 for around 2 hours – until tender and the meat is pulling off the end of bones. 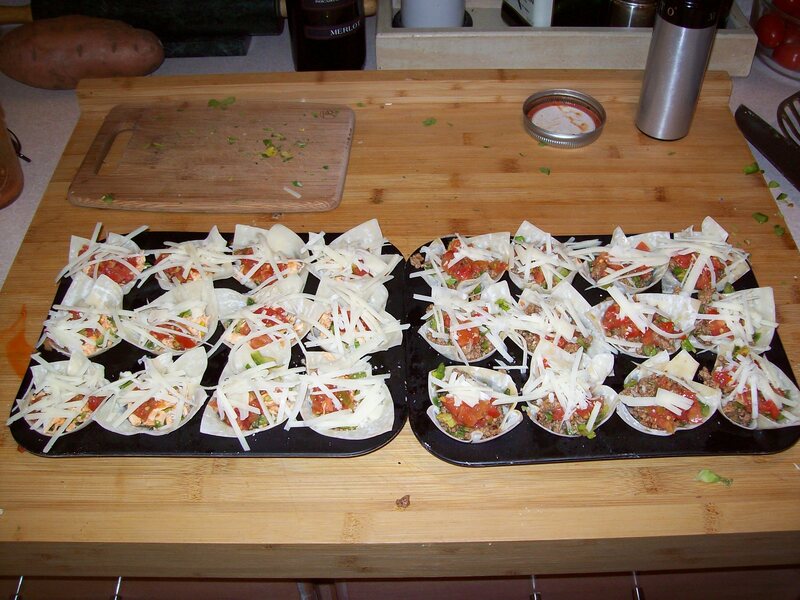 Remove from oven, open foil and drain the liquid. 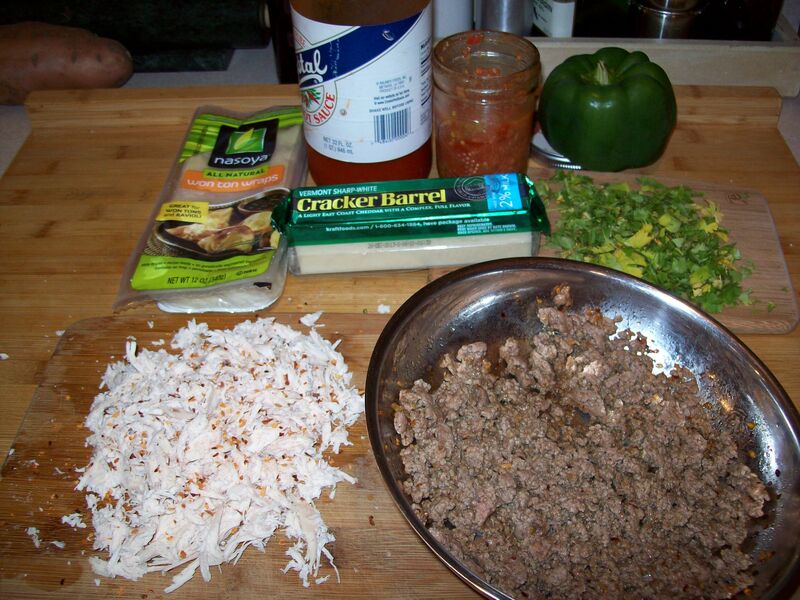 Now brush BBQ sauce of your choice on all sides, you don’t need a lot. I cut the slab in half before the grilling, making it easier to flip and remove. 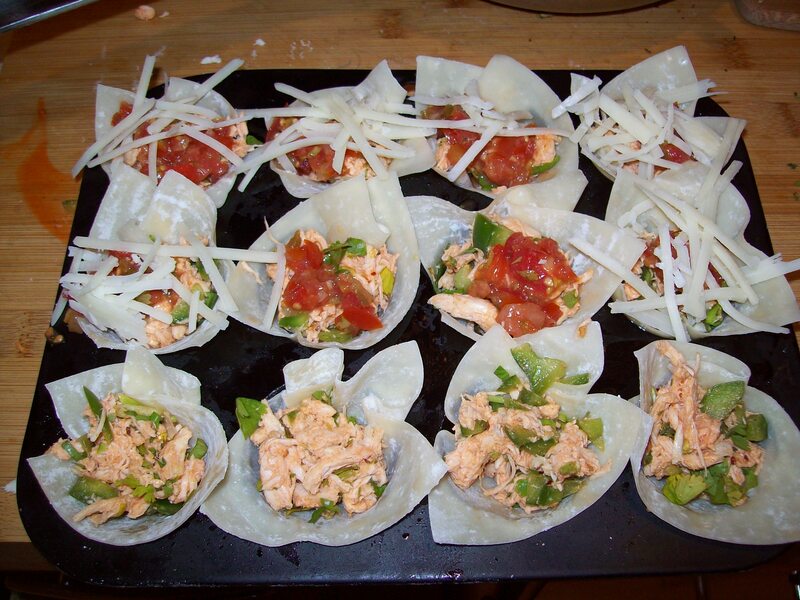 Remove cover loosely with aluminum foil and let sit for about 5 minutes, goes for the swordfish also. Server up take a snap chat and send to you Mike and Laurel who were driving to Indiana enjoying rest stop food. I don’t know about you but I just love the flavor of Hoisin sauce not sure what it is about it but it is soooo good. 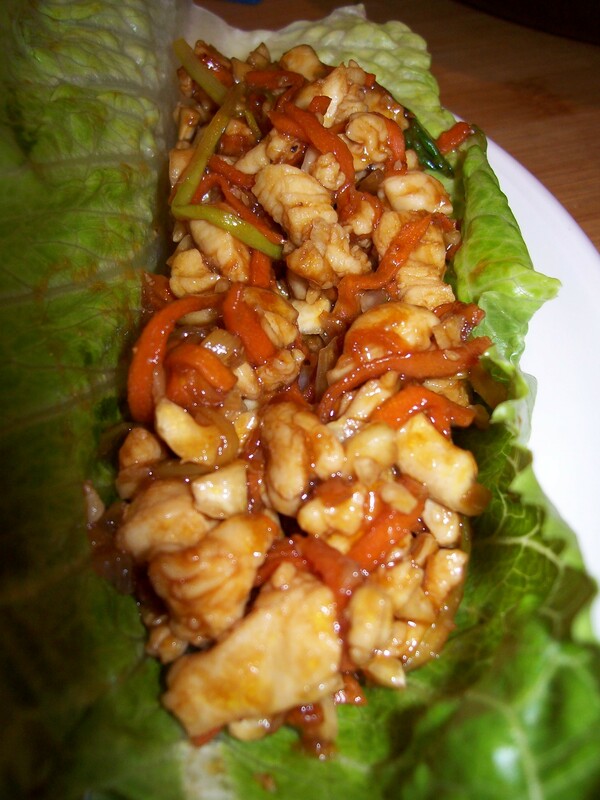 I had a craving for it the other day and when I took the boneless chicken breast out of the freezer I kind of thought that a lettuce wrap would be a good thing to make. I included the avocado because I am still celebrating the beginning of avocado season. 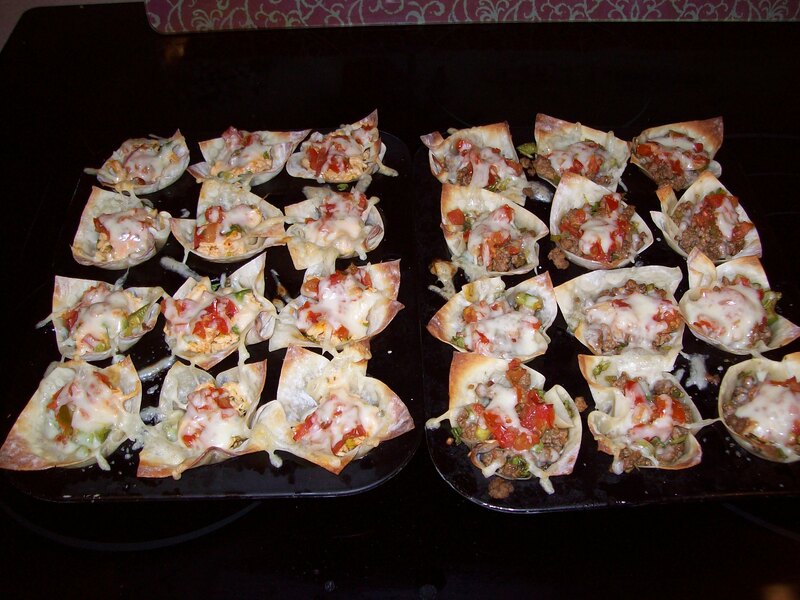 Anyway this is a dish that is from the gut one never knows what is in the frig or cabinets and what tickles the taste buds until you see it. A few asparagus (depending on size) thinly julienned – another spring crop delight! Pan sear in a drizzle of olive oil until lightly browned about 2-3 minutes over medium heat. 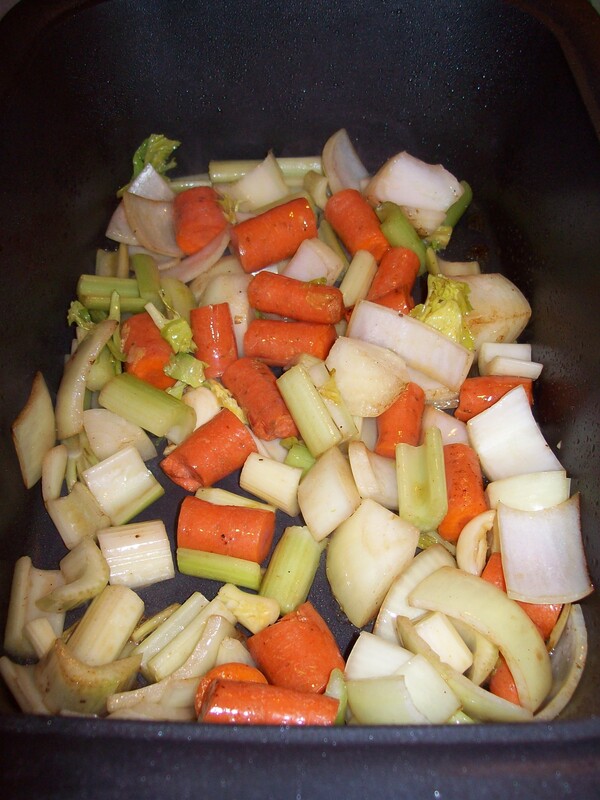 Add carrot, asparagus and cashews and cook for about 1-2 minute add the hoisin sauce and stir to coat. 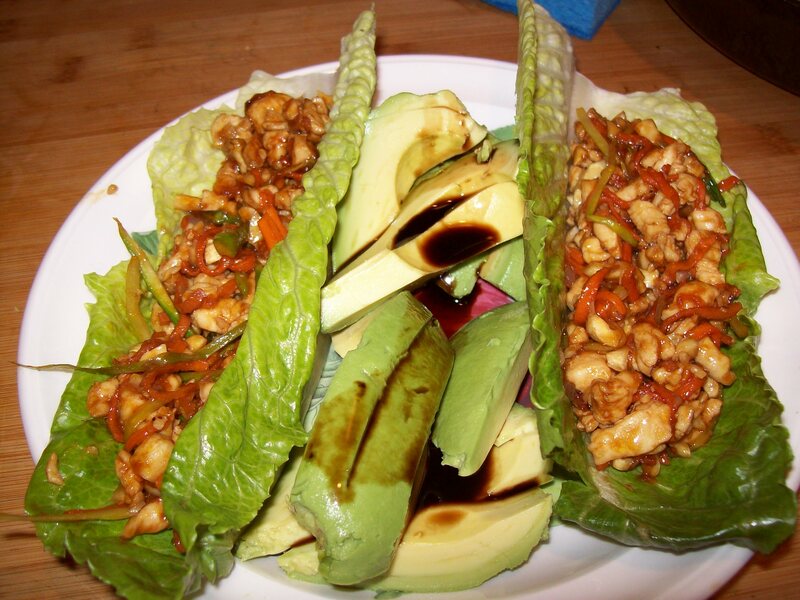 Spoon into lettuce and enjoy. Oh I used the leftovers in my salad that I brought for lunch today!! Q. I’ve heard hoisin sauce is like a Chinese barbecue sauce, but I’m not sure if that’s true. What exactly is hoisin sauce? A. In some ways, hoisin sauce is like a Chinese barbecue sauce: it’s used in Chinese cooking much like barbecue sauce is used in American cooking. 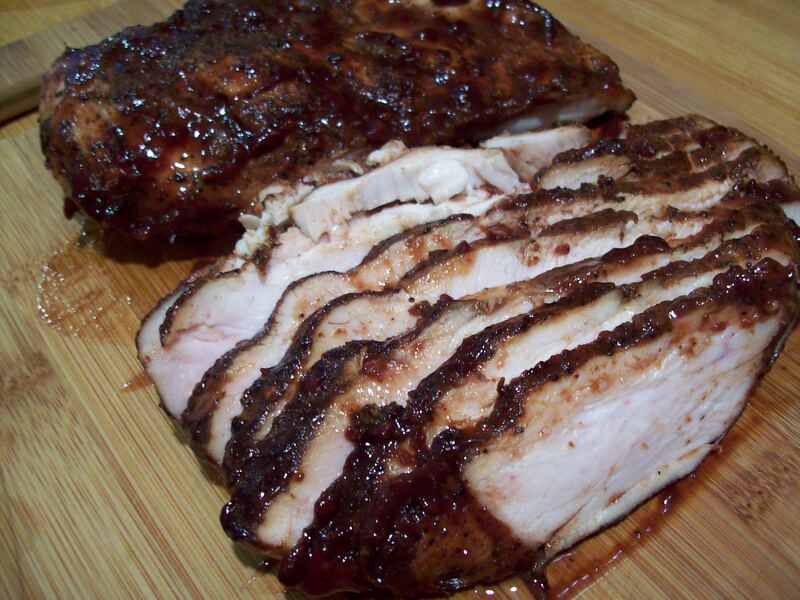 The Chinese use hoisin sauce as a glaze for meats and as a condiment. Hoisin is a reddish-brown sauce that’s salty, sweet, and spicy. 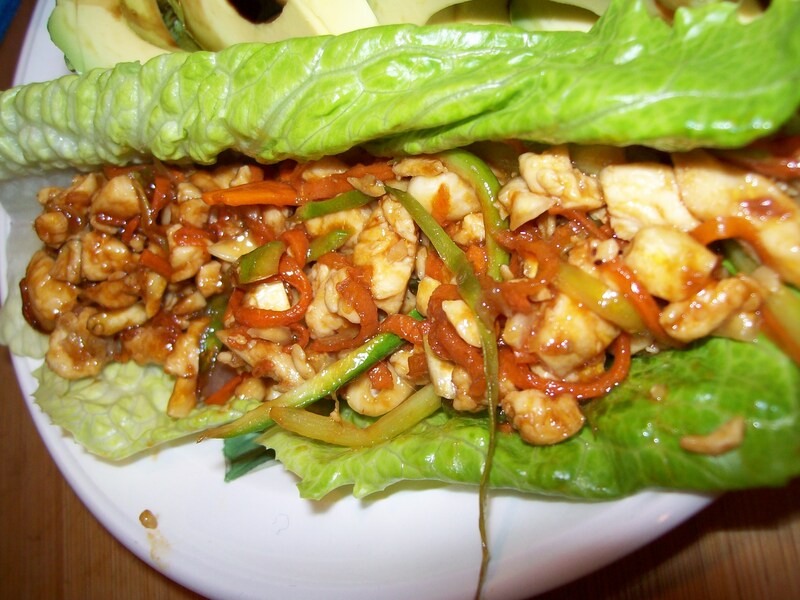 Hoisin sauce is made from soybean paste, garlic, chilies, and various spices, and can contain sugar and vinegar. 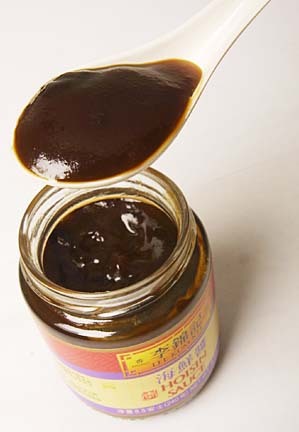 Hoisin sauce is also sometimes called Peking sauce, because it’s used in making Peking duck. 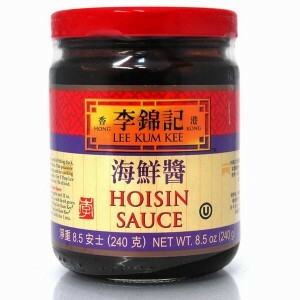 Hoisin is a great glaze for meat and fish. 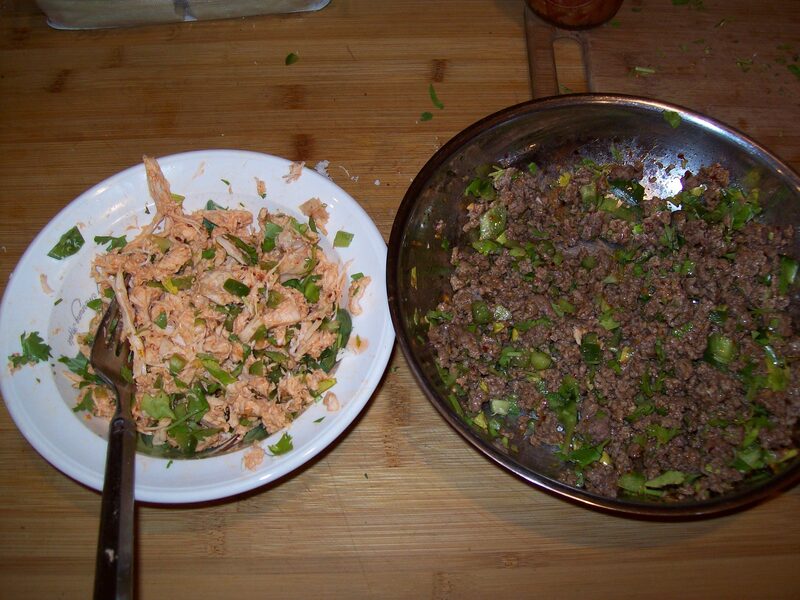 A little dab of hoisin sauce also gives extra flavor to stir-fry and noodle dishes. 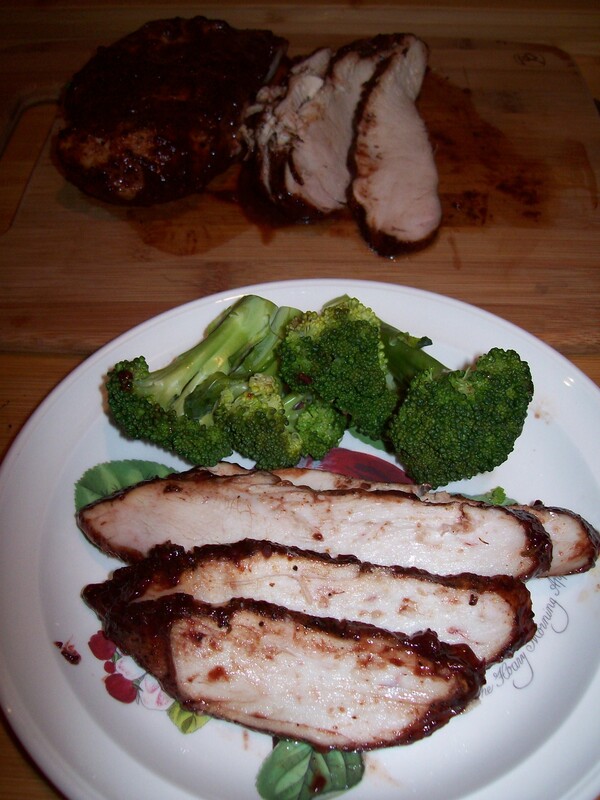 Coffee and Spice Rubbed Boneless Chicken Breast with BBQ Raspberry Sauce. We bought this Coffee and Spice rub at Williams and Sonoma outlet store and tried it on Steak and fish but it just couldn’t find the right fit. For some reason the combination of this with chicken did not appeal to me so I never went there, but my wife did the other night and we both enjoyed it very much. So yesterday after returning home from Wholefoods with some air chilled chicken breasts I grab one and rubbed it with the Coffee rub, wrapped it and left in frig overnight. 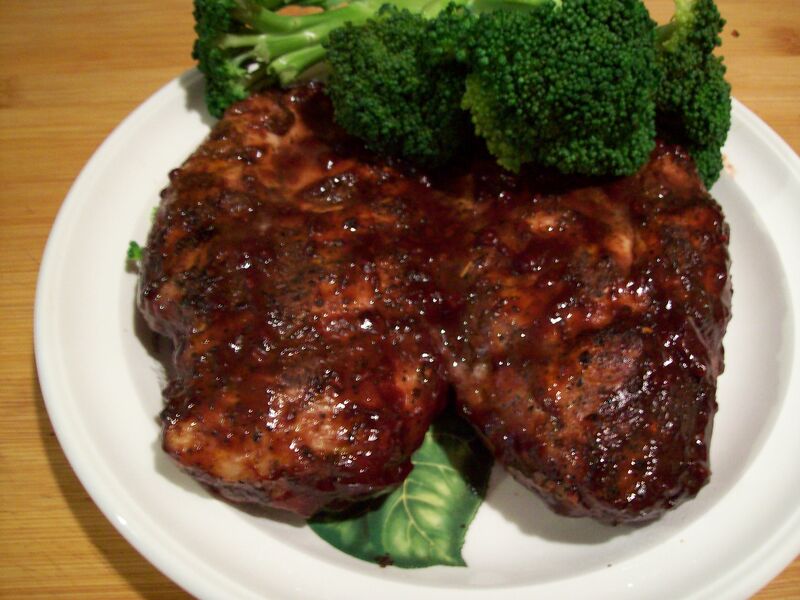 I decided that I would use some of the Raspberry BBQ sauce as a last minute glaze and the combo was very good. Juicy, Tender, Melt in our mouth. This got the two heads bobbing approval from Lyn and I.
Liberally rub the chicken breast with the coffee rub, wrap and refrigerate. I refrigerated overnight but I think at least 3 hours would work. Place chicken breast on grill and grill for 4-5 minutes flip and repeat. 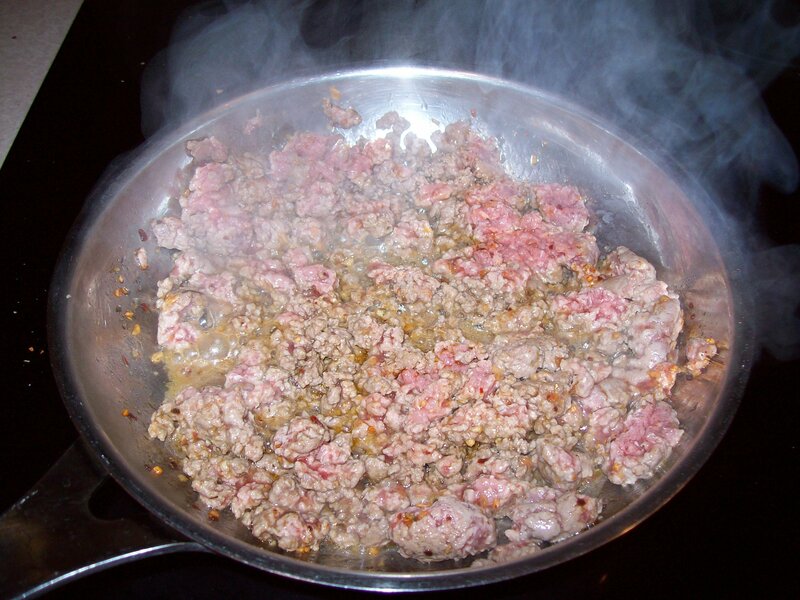 Brush on remaining sauce and flip cook about 1 minute. Note: each grill is different so you will have to determine the length for doneness. 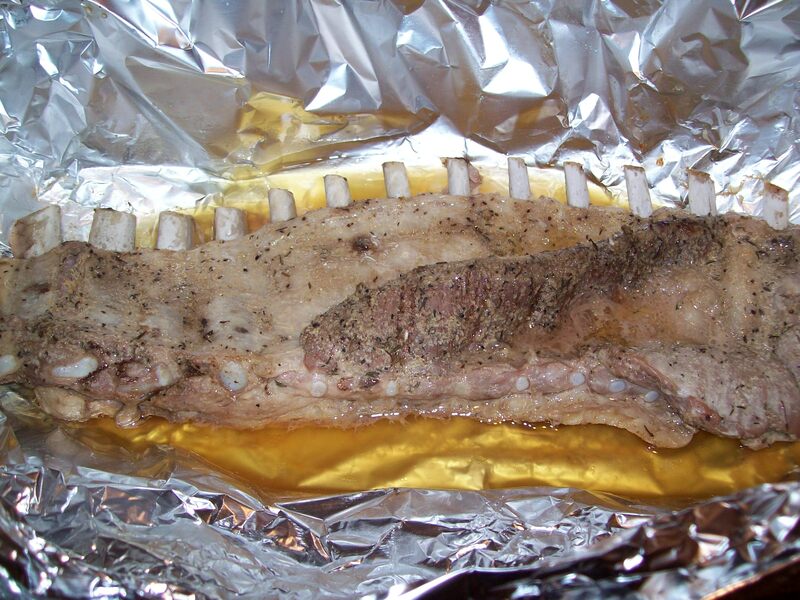 Remove from grill and left sit loosely covered with tin foil for 8 minutes.